If you are thinking of getting rolldown storm screens - think again. 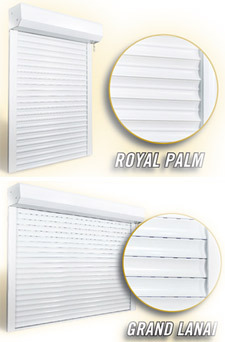 You can get real metal rolldown hurricane shutters for less money than rolldown storm screens! Introducing our Royal Palm Shutters. Let us show you revolutionary NEW hurricane protection system today. Combining patented material and stylish design allows our hurricane strength shutters to look more attractive and cost you less. Save thousands of dollars with styles and colors that match your home’s design. Our professional team of experts will provide worry-free installation as well as impeccable customer service that includes personalized weekly project updates. Update your home’s look with roll shutters at a price you can afford. Lifestyle Exterior Products offers many color combinations so that your new shutters match the aesthetics of your home. You can chose from our existing selection or we can custom match it to your preference.